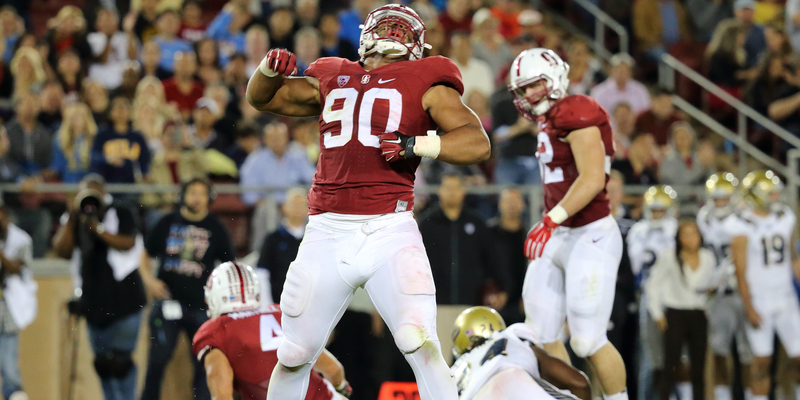 Editor’s Note: Solomon Thomas is my favorite player in this year’s draft. And it’s not close. Solomon Thomas has the potential to be one of the best pass rushers in the entire league. Physically, he has everything you could want: size, speed, length, strength, quickness, agility and explosiveness. His SPARQ score was in the 93rd percentile, tied with T.J. Watt for fourth-best in this class and two percentage points better than Leonard Floyd tested last year. Thomas really burst onto the scene with a dominant performance against North Carolina. When everyone was trying to watch Mitch Trubisky, Thomas kept exploding onto the screen. It was impossible to not notice him. In all, he had 61 tackles — 14 for a loss — 8.5 sacks and one forced fumble. For an edge player, Thomas is really good at holding up at the point of attack. Teams are going to struggle if they try to block him with a tight end or fullback. He could start in the Bears base defense and move to a three-point stance on third-and-long, essentially replacing Cornelius Washington and limiting the snaps Pernell McPhee has to play. For the Bears, Thomas would be an edge player, but we’ve never seen him play in a two-point stance regularly. He was an end who slid inside at Stanford. The Bears would be playing him in space and we have no idea if he can actually do it. In fact, I’d be willing to bet he played in a four-point stance more. The athleticism tells us he should be able to do it, but there’s a lot more to it than being a great athlete. He has to see the field and anticipate better if he’s going to be playing space and we just don’t know if he can. He can’t play defensive line for the Bears. He weighed 273 pounds at the Combine and played even lighter. He struggled taking on double teams in college and would have no chance at the NFL. We saw how badly Jonathan Bullard struggled with his transition from shooting gaps to taking on blocks and Thomas is a full 12 pounds lighter. Does Thomas really make them that much better? In theory, he’d be taking McPhee — their best defensive player — off the field on early downs. On late downs, they still have Willie Young and, possibly, Lamar Houston to rotate in. Thomas doesn’t really fit a need. The Bears already have a really good pass rush and they’re one player away from having a great pass rush. Thomas could be that one guy. To me, this pick comes down to the input of Jay Rodgers and Vic Fangio, two of the best at what they do in the entire league. Kicking outside isn’t going to be an easy transition for Thomas. He’s going to have to learn more pass-rush moves and change how he plays. But if Rodgers and Fangio think he can do it, then I think it would be really hard to pass on him. The Bears can get a good cornerback and safety in the later rounds. They can’t get a pass-rusher like Thomas later. Maybe he doesn’t fill a need, but teams can never have too many pass rushers. Thomas could give the Bears the extra juice they need to become a truly dangerous defense.